Perhaps you’ve heard of the false promise of Bright Green Technology? If you couple that with a strong dose of human-centrism, you might have something like Ecomodernism. That’s not a good thing. Deep Green Resistance co-founder Derrick Jensen explains. 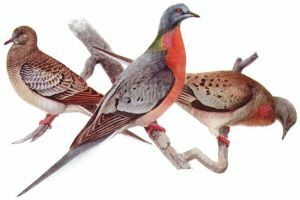 Remade by man: the Passenger Pigeon. Juvenile (left), male (center), and female (right), from ‘Birds of New York’ (University of the State of New York) 1910-1914. Illustration by Louis Agassiz Fuertes (1874-1927), Public Domain via Patrick Coin on Flickr. The idea of a ‘good, or even great, Anthropocene’ as promised in the Ecomodernist Manifesto is purely delusional, writes Derrick Jensen. Worse, it underlies a narrative in which the wholesale destruction of nature and of sustainable indigenous societies is repackaged as a noble mission – one whose ultimate purpose is the complete alienation of humans from the planet that spawned us. Robert Jay Lifton noted that before you can commit any mass atrocity, you must convince yourself and others that what you’re doing is not atrocious, but rather beneficial. You must have what he called a “claim to virtue”. Thus the Nazis weren’t, from their perspective, committing mass murder and genocide, but were ‘purifying the Aryan Race’. They weren’t waging aggressive war but gaining necessary Lebensraum. The United States has never committed genocide, but rather has fulfilled its Manifest Destiny. It has never waged aggressive war, but rather has ‘defended its national interest’ and ‘promoted freedom and democracy’. Today, the dominant culture isn’t killing the planet, but rather ‘developing natural resources’. This is to say that any culture foolish and insane enough to murder the planet that is our only home would of course be foolish and insane enough to attempt to provide justifications for this murder. That brings us to An Ecomodernist Manifesto, the same sort of claim to virtue we’ve come to expect from this culture’s several thousand year tradition of nature-hating. Heck, the first written myth of this culture is of the hero Gilgamesh deforesting what is now Iraq to build a city and make a name for himself. Fast forward a few thousand years, and that’s the same nature-hating and empire-building story being told in An Ecomodernist Manifesto (and that has been told in myriad ways in between). The narcissism, entitlement, and gaslighting starts at the beginning: “To say that the Earth is a human planet becomes truer every day. Humans are made from the Earth, and the Earth is remade by human hands. “The Earth is remade by human hands” … ‘Remade’ is such a nice word, isn’t it? Much better than ‘destroyed, murdered, ravaged, grievously harmed’, don’t you think? Gilgamesh and those who came after didn’t deforest and desertify what was once called the Fertile Crescent, they ‘remade’ it from cedar forests so thick that sunlight never touched the ground into cities and deserts. The Egyptians and Phoenicians didn’t kill the forests of North Africa, they ‘remade’ them into navies and deserts. This culture hasn’t wiped out 98% of the world’s ancient forests, wetlands, grasslands; it’s merely ‘remade’ them, complete with ‘remaking’ the plants and animals there into extinction. This culture isn’t killing the oceans; it’s merely ‘remaking’ them such that there probably won’t be any fish. It’s not extirpating elephants and great apes and great cats and two hundred species per day; it’s merely ‘remaking’ them so they’re extinct. It doesn’t commit land theft and genocide against Indigenous peoples, instead it merely ‘remakes’ them and their landbases. Further, the sort of remaking they’re talking about in this Manifesto is not done by all humans, as they claim. It’s done by specific sorts of humans, who feel entitled to take everything on the planet, the sorts of people who might call it a ‘human planet’. I live on Tolowa Indian land in what is now far northern California. The Tolowa lived here for at least 12,500 years, and when the Europeans arrived, the place was a paradise. There were so many salmon in the rivers that the rivers were “black and roiling” with fish. The Tolowa and Yurok and Hoopa lived here truly sustainably, and could have continued to do so more or less forever. Members of the dominant culture arrived less than 200 years ago, and immediately embarked on campaigns of extermination – the authors of An Ecomodernist Manifesto might call these ‘campaigns of remaking’ – against the human and nonhuman inhabitants. And what was the point of all of these campaigns of extermination remaking? It was no different in the 1830s than it is now, and it is no different now than it was in the time of Gilgamish. The end of violence! Really … ? Who would have guessed that when you redefine violence perpetrated by your culture as not being violence but rather as ‘remaking’, that you can then claim that “violence in all forms has declined significantly”? I’m not sure members of the two hundred species driven extinct today would agree that “violence in all forms has declined significantly.” Nor would members of Indigenous human cultures being driven from their land, or being exterminated: Indigenous human languages are being driven extinct at an even faster relative rate than are nonhuman species. But I guess none of this counts as violence in any form whatsoever. Because of this culture’s ‘remaking’ of the planet, wildlife populations across the world have collapsed by 50% over the past forty years. Because of this ‘remaking’, the oceans are acidifying, and are suffocating in plastic. I guess none of this counts as violence in any form. This ‘remaking’ of the planet is causing the greatest mass extinction in the history of the world, in fact so far as we know the greatest mass extinction in the history of the universe. And violence is down? Only because they don’t count the violence they don’t want to count. They also don’t count the violence of subsistence farmers being driven from their lands. Nor do they count the violence of humans (and nonhumans) losing their traditional ways of living in this great ‘remaking’. They don’t count the horrors of factory farming or row-crop agriculture. The rule of law and increased freedom. Oh yeah? I don’t think those subsistence farmers forced from their land and into cities would agree they’re living in a time of increased freedom. And I don’t think any of us have the freedom to live free of the world this culture is ‘remaking’. Once you give in to this culture, stop defending your land from this culture, become dependent on this culture, work for this culture, identify with this culture, propagandize for this culture, serve this culture, then the culture and its proponents may stop attacking you. But if you don’t give in, you will be exterminated. As we see. And none of this is considered violence. A few years ago I was interviewed by a dedicated Marxist who believes it’s possible to create an industrial system in which all economic exchanges are voluntary, absent of any violence or coercion. Of course, as with the authors of An Ecomodernist Manifesto, he didn’t count violence against nonhumans or the natural world as violence. He also said that cities could exist under such a society. “Where do you get the miners?” Mining is one of the first three forms of slavery, and the primary way to get people into mines has always been coercion, whether it’s at the point of a sword or gun; or through laws such as those of apartheid; or through other means of destroying people’s access to land, and therefore access to food, clothing, and shelter, and therefore self-sufficiency. Cities have always depended on a countryside (also known as colonies, also known as nature) to exploit. Often those trying to justify the destructiveness of this culture conflate Indigenous people living in place and affecting their landbase with the clearly destructive activities of transnational corporations. The claim seems to be: because humans lived someplace, and affected the land there (as every being will affect all other beings: the bacteria who live inside of you affect you, some in very positive ways), then that gives the dominant culture carte blanche to act however it wants. This is, of course, completely insane (and self-serving). Anyone with integrity understands the difference between Indigenous peoples living in the same place for 12,500 years and the place being capable of supporting them for another 12,500 years, and the dominant culture extracting resources to make a buck (oh, sorry, ‘remaking’ the place). Of course humans affect the land. Salmon affect the land. Alder trees affect the land. Beavers affect the land. 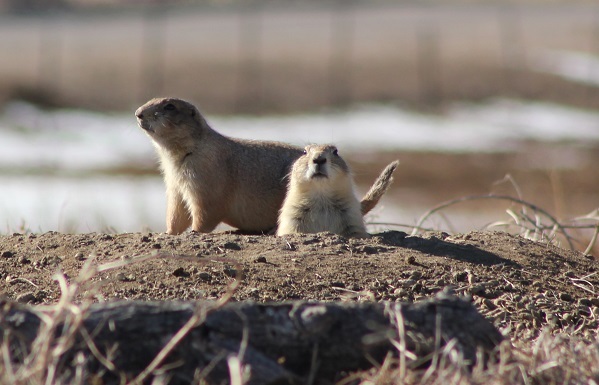 Prairie dogs affect the land. Wolves affect the land. Oyster mushrooms affect the land. But the question becomes: does your presence on the land help make the land healthier? There’s a world of difference between participating in a living landbase on one hand; and extracting resources or ‘remaking’ the land on the other. The former is a relationship; the latter is theft, murder, and control. It was said of the Indians of northern California that they of course made decisions that affected the land (just as do salmon, redwood trees, and everyone else), but that these decisions were made on the understanding that the people were going to be living in that same place for the next five hundred years. In other words, their decisions were made based on their embodied understanding that their own health was entirely dependent upon the health of the land. But that’s not the ‘problem’. That’s the reality. We live on the Earth, our only home, our only source of air, water, food, shelter, our only source of everything that brings life. It is physically impossible to ‘decouple’, to use one of the favored words of the Manifesto’s authors, the health of the land from the long term health of those who are dependent upon this land. Sure, you can steal from the land to build a city and a navy, and use that city and navy to conquer more land. Sure, you can continue on a path of expansion across the globe, cutting down forests and draining wetlands and damming rivers and making dead zones in oceans and extirpating nonhumans and stealing land from Indigenous peoples who were living there sustainably, so long as there are always new forests to cut down, new prairies to convert to croplands (and then to wastelands). So long as there are new frontiers to violate and exploit, new places to conquer and steal from (sorry, ‘remake’) you can continue to overshoot carrying capacity and destroy the planet. And in the meantime, you can build a hell of a big city and a hell of a big name for yourself. But you should never pretend that can be sustainable. The Ecomodernist bacteria insist that what’s really necessary is to decouple (one of their favorite words, too) their own well-being from that of the petri dish. This discussion flourishes until the end, when the ‘remade’ petri dish can no longer support life. The industrial monoculture diet – you call that ‘rich’? First, ‘average per-capita use of land’ is a ridiculous measure of ecological or social health. The point of life is not, as the Bible suggested, to “go forth and multiply.” The point is not, to move this to the 21st century, to project capitalism’s definition of success onto the real world and try to ‘get large or get out’. The point is and always has been the health of the land. A society with fewer members living in a long-term participatory, mutual relationship with the land is a far better measure of ecological and social health than is how much land each person requires. A sane culture would figure out how many people a piece of land can permanently (and optimally) support, and then make sure they’re below that number. An insane culture would overshoot carrying capacity and then consider itself superior because it (temporarily) supports more people per square mile. But that’s not even the main lie, which is the absurd claim that “modern people enjoy a far richer diet.” Right now just three plants – rice, wheat, and millet – provide 60% of humans’ food energy intake, and 15 plants provide 90%. Further, the provision of these foods is increasingly controlled by large corporations: four corporations control 75% of the world grain market. We can make similar statements about other food markets. In contrast, the diet of hunter gatherers routinely included scores or hundreds of varieties of plants, plants not controlled by distant corporations. This is crucial, because if those in power can control a people’s food supply they can control their lives, which means they can force them to work for the elites: so much for the ‘freedom’ of this new ‘remade’ world. And then there’s the fact that no one can anymore eat passenger pigeons, Eskimo curlews, great auks, or any of the other food staples this culture has caused to go extinct in its great remaking. And these days with the best tasting fish generally having been driven (at least commercially) extinct, increasingly corporations are selling what were once considered ‘trash fish’ as luxuries. All of this is one reason the corporate press is increasingly praising insects as food: we’ve either destroyed or are destroying other foodstocks. So it’s simply a lie to say modern diets are richer. And finally, for the primary conceit of the Manifesto, which is that the world can be ‘remade’ without destroying it. Let’s test their thesis. Name five biomes that have been managed for extraction – ‘remade’, to use their term – by this culture that have not been significantly harmed on their own terms. It can’t be done. Over the past several thousand years, this culture hasn’t managed for extraction a single biome without significantly harming it. They say one sign of intelligence is the ability to recognize patterns. How stupid must our claims to virtue make us if we cannot recognize this pattern, with an unbroken string of failures running several thousand years and at this point literally covering the entire planet, from the deserts of Iraq to the garbage patches in the oceans to the melting icecaps to the dammed and polluted rivers? Of course if your goal is to ‘remake’ the world to create luxuries for yourself, and if you don’t care that this ‘remaking’ destroys life on the planet, then you might not consider this to be a consistent pattern of failure. You may consider this a great success. Which in and of itself is pretty stupid. Out of the more than 450 dead zones in the oceans – caused by this culture’s ‘remaking’ of the planet – only one has recovered. It’s in the Black Sea. It recovered not because humans ‘decoupled’ themselves from the earth, but rather because humans were forced to ‘decouple’ themselves from empire. The Soviet Union collapsed, and this collapse made it so agriculture was no longer economically feasible in the region. In other words, humans could no longer ‘remake’ the world in that place. And the world, or rather, that one small part of the world, began to recover. The authors of An Ecomodernist Manifesto have it completely backwards. For several thousand years this nature-hating culture has tried as hard as it can to define itself as other than nature. It has tried to separate itself from nature, to pretend it is not of nature. To pretend it is above nature, better than nature. That what it creates is more important than what nature creates. It has tried to pretend that it is not dependent on nature. If we wish to continue to live on this planet, we need to recognize and remember that it is our only home and that we are dependent upon this planet, and that this dependence is a very good thing. Far from attempting to ‘decouple’ our well-being from that of the planet – which this culture has been trying to do for a few thousand years now, to the detriment of everyone this culture encounters – we need to recognize and remember that our own well-being has always been intimately dependent on the health of the planet. And those of us who care about life on the planet must stop those who are currently remaking – read, killing – this planet that is our only home.